It’s surgery day and you are heading to the hospital. As things are different depending on your doctor and hospital, there some consistent things to expect. Checking In. When you get to the hospital, you need to check in with your insurance card and ID. After you check in, they will have you go into the changing room. In the changing room. The hospital staff will give you a hospital gown, booties and a plastic bag to put your clothes in that you wore to the hospital. Then they will ask you to provide a urine sample and take blood to determine your blood type in case of emergency as well take your vitals. Make sure you take anything metal out of your hair like bobby pins. You can wear a scarf but it should be 100% cotton. 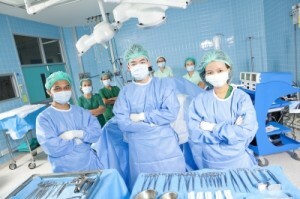 Your surgeon/anesthetist may come out and talk to you and your family to discuss the procedure and ask any questions. Operating Room. This part is pretty surreal. It does look like something out of Grey’s Anatomy. This is where they prep you and put you under the anesthesia. Lights out and you are in la la land.